Each year, flooding causes billions of dollars of property damage and loss of life all over the world. Being able to accurately predict where a flood will occur can help governments and residents prepare, and minimize the damage – and that’s a speciality of Ambiental Risk Analytics. Working with Omnis Systems, a UK systems integrator, Ambiental® has deployed a high-performance private cloud solution from OnApp, running on Intel®, to power its unique technology for river, tidal, and surface water risk mapping, modeling and forecasting. Using its own private cloud infrastructure, Ambiental has significantly improved its responsiveness, and saved an estimated 75% of the cost of running its compute-intensive workloads in third party clouds. Ambiental’s ultra-high-detail flood risk data, risk maps and reports are invaluable for insurance companies, reinsurers, utility providers, property developers, council planning departments and government organizations. Producing accurate flood predictions is a hugely compute-intensive process – and with Ambiental taking on new projects, and working on a proposal to provide flood analysis for an entire country, they needed to find a way to increase their compute resources. To simulate all rivers in the UK, for example, Ambiental would need to simulate over one million independent models, with each model consisting of anywhere from a few tens of thousands of cells, to a few million, with each cell communicating with its neighbors at every iteration/time-step of the simulation. Each simulation models between a few hours and a few days of ‘simulated time’. Ambiental had previously relied on outsourced HPC (High Performance Computing) infrastructures to do the bulk of their modeling work – but this presented them with a number of problems. If the outsourced solution was down, or not available, it impacted processing time. Using outsourced HPC also increased data transfer time, and made maintenance, troubleshooting and security more problematic. Resource planning was an issue, too, as some workloads required a large number of small VMs, while other workloads ran on VMs requiring large quantities of RAM and CPU cores. Ambiental first considered public cloud services, but soon discovered that using public cloud to run their types of workload would be prohibitively expensive. Instead, they found the solution in a private cloud appliance from Omnis Systems, an Intel Technology Partner. Omnis created a solution with OnApp’s private cloud management platform running on Intel® Data Center Blocks for Cloud. “The ability to be self-sufficient when it comes to data hosting, delivery of our products and running the simulations is very important to us. This drove the need to have an in-house HPC/Cloud Computing solution that we can fully control,” said Justin Butler, CEO at Ambiental Risk Analytics. Ambiental’s system had to be able to run at least 60 computational VMs for core services with the ability to spin up additional VMs to manage collaboration and security for the cluster. Management of the cluster had to be easier than competing products. It had to be quickly and easily scalable beyond the initial configuration – and had to be cost competitive. Omnis provided Ambiental with an OnApp private cloud cluster based on Intel’s L9 Cloud Block to evaluate for two months. They were immediately impressed with its ease of setup, complete single pane of glass management, and feature rich software for private cloud. From receiving the cluster to running their first test workloads took only three days. After initial setup, Omnis Systems helped Ambiental test the platform with Ambiental-specific workloads. To give them a reasonable quantification of the benefit of the OnApp private cloud, they mapped out their processes from core production, applied each solution and evaluated how well it could improve each step of the process. They also ran benchmark tests against another platform and examined technical results as well as administrative overhead. In this part of the evaluation, the benefits of OnApp included having everything in one place with fast administration of VMs and increased security. Ambiental’s OnApp cluster ran 63 VMs for the evaluation and is ready to scale to hundreds or thousands of VMs by increasing the number of nodes. Nodes can be on the local cluster or even in remote sites, if customers require it due to regulations and data sensitivity, without disrupting current workloads. Following the successful evaluation, Omnis Systems provided Ambiental with a rack-mounted OnApp private cloud based on Intel® Data Center Blocks. 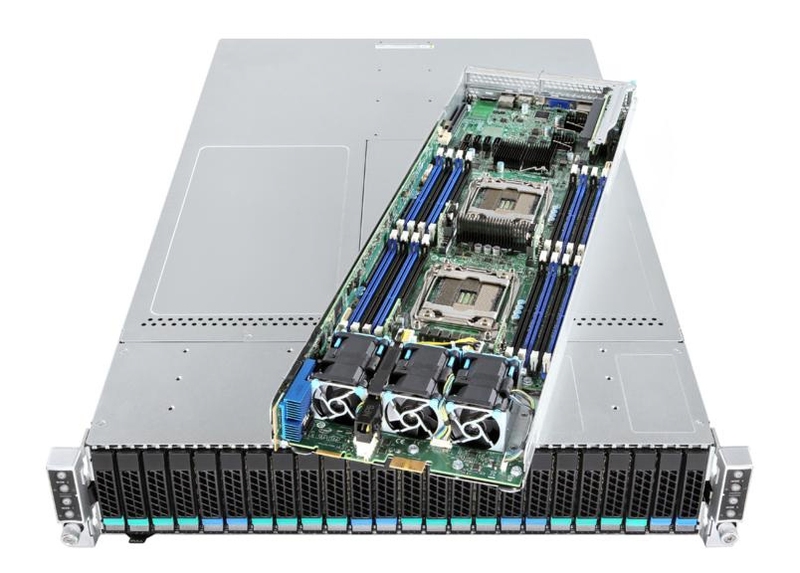 It has four nodes in an H2224XXKr2 chassis with 144 cores, 1TB RAM + Intel DC P3520 Series SSDs. Each node was configured with 6TB storage, which is needed for analysis and post-processing. Then the job is moved off to other servers for QA. Storage or RAM can easily be added if required. Intel® Server Chassis H2224XXKR2 Supporting up to Four Hot-Pluggable Intel® Compute Modules, up to Eight Intel® Xeon® Processors and up to 24 2.5 Inch Hot-Swap Drives. Huge time savings – now Ambiental doesn’t have to book HPC time with a third party, or experience delays uploading data to a remote system. This alone saves days of work – while the ability to spin up VMs with a couple of clicks, allows the Ambiental team to quickly meet current and future processing requirements. Significant efficiency gains – previously, Ambiental’s modelling process required segmenting terrain models into small pieces, integrating with hydrology data on individual workstations, and then transferring to the server for modeling, where they would have to stitch everything back together. With their OnApp private cloud they can do it all on the same disks. “It has allowed us to scope much larger projects operating with higher resolution and accuracy levels in a shorter amount of time due to the speed and efficiency improvements,” said Justin Butler, CEO, Ambiental Risk Analytics.